I’m sorry? This is a chocolate bar, you say? Some days I wander the aisles of Trader Joe’s, vainly seeking for something that piques my interest, and sometimes Trader Joe’s makes it easy. 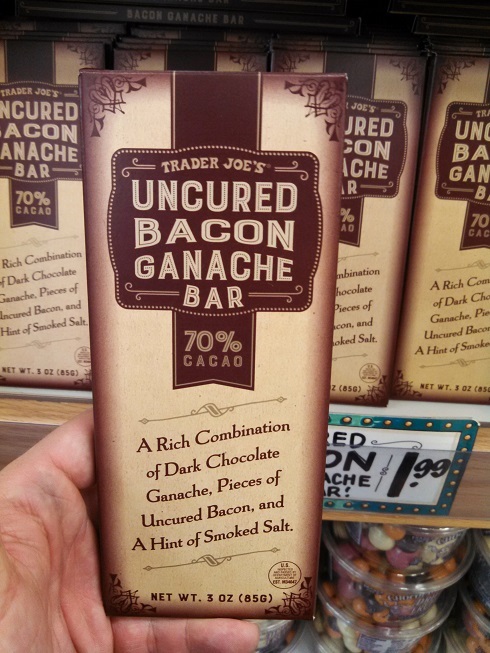 There was certainly no way in hell, for example, that I wasn’t picking up Trader Joe’s Uncured Bacon Ganache Bar. If there’s such a thing as baiting the trap too richly, this is it – metaphorically and literally. We’re talking about a bar of bold, 70% dark chocolate, injected full of chocolate cream sauce and infused with crispy bacon bits. The resulting trip is as delicious and intense as that description makes it sound. What it is: Dark chocolate bar, with ganache and bacon filling. Worth it: Yes! An intensely delicious ride for cheap. Not since Trader Joe’s Sweet Srircha Bacon Jerky have I encountered a product name with such scene-stealing panache. Or ganache, as the case may be. Clearly Trader Joe’s has seen what Chuao has been doing with their amazing candy and spice infused Firework bars, and decided they can one-up them at their own game. The Uncured Bacon Ganache bar is, shockingly, exactly what it says it is. Starting with a rich, semi-sweet (read, “bitter”) 70% dark chocolate, Trader Joe’s has then piped each individual square full of syrupy caramel-and-chocolate-ganache mixture. This makes the candy bar decadent, but what really sets it apart are two things – the heavy touch of smoked salt, and the crunchy bits of bacon peppered throughout. The result is a tongue-top riot of deep bitter chocolate, super sweet caramel, and savory, tasty saltiness. In short, it’s beautiful. The Trader Joe’s Uncured Bacon Ganache Bar – in action! The success of the whole bar depends heavily on the intense ganache filling. 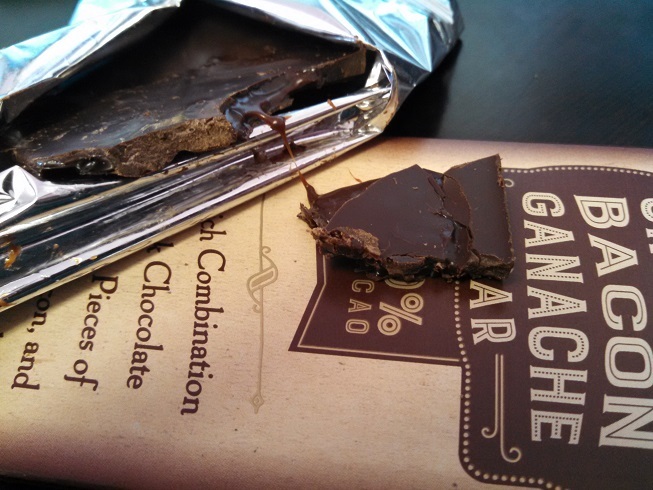 I have to admit that despite hearing the word almost constantly nowadays, I didn’t exactly know what a “ganache” was. In it’s basic form, it’s just dark chocolate mixed with cream to create a velvety chocolate sauce. Again, that’s in its basic form. Trader Joe’s modifies their ganache so dramatically that it probably doesn’t deserve the name any more. In addition to the melted chocolate and cream, TJ’s adds a healthy dose of pure, and unheralded, caramel that really ups the sweetness factor. The real star, however, is the alder smoked salt. Rather than dusting the bar with salt, like they’ve done with their recent dark chocolate and sea salt offerings, the salt seems to be mixed into the ganache itself. The result is a salty-caramel-chocolate syrup filling. Like we saw with Trader Joe’s Dark Chocolate and Sea Salt grahams, and their Milk Chocolate Jumbles, a little sea salt and chocolate is a winning combination. That equation adds up here too, where the salt content has be ramped way up and melted into the candy itself. In fact, there’s so much salt in the filling that it tastes more salty than sweet, at least at first blush. I actually liked this, because it balances out the darker, heavier tones of the dark chocolate, and also helps bring a little life to the bacon crumbles. The bacon, by the way, needs all the help it can get. Despite top billing, the bacon doesn’t make much of an impression in this bar. Its presence is limited to a sprinkling of small crumbles which are baked into the chocolate itself, rather than incorporated into the filling. Whatever savory or salty taste the bacon still has is overpowered by the intense dark chocolate and the saltier ganache. You’ll mainly only notice these nubs as bits of texture, tough flecks of a vaguely meaty substance that show up from bite to bite. While they do lend a very subtle bacon flavor to the candy bar, there’s not really enough to make much of an impact, and the bar would be just as good without it. Underwhelming bacon performance aside, this is a fine fine chocolate bar. Taken alongside the new Firework Bar, it signals a delicious future for Trader Joe’s chocolate aisle. Would I Recommend It: Yes, to lovers of intense chocolate everywhere. Would I Buy It Again: Sure, once I’ve recuperated sufficiently from this one. Final Synopsis: A tasty bar without much bacon, but more than enough caramel, salt and dark chocolate. You know how much you like bacon? Well this doesn’t have any. 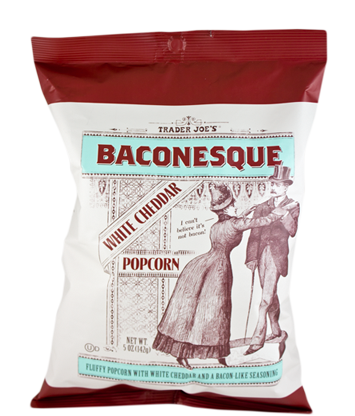 It’s hard to know what to say about Trader Joe’s Baconesque White Cheddar Popcorn. It’s unusual certainly – the most unusual popcorn I’ve had since Trader Joe’s last weird popcorn experiment (or maybe the one before that) – but unusual in a very different way. This popcorn is, weirdly, exactly what it says – a vaguely bacon-y kind of popcorn. Not bacon popcorn, not popcorn with bacon bits, bacon flakes or even real bacon flavor, but a bacon-esque popcorn. Popcorn, in this case, that has been infused with a fake bacon smoke flavor. That fake bacon flavor is mingled with an intense white cheddar cheese powder results in a bizarre, slightly off-putting, but addictive snack. I’ve written before on my opinion of bacon-mania. Although longer lasting than many of the food fads that have swept the nation, it stills shares the same quality of food fads everywhere – whether it be bacon vodka, or chocolate covered bacon, novelty comes first and quality is the afterthought. So when I see a new bacon gimmick on the self I’m immediately skeptical. Does Trader Joe’s Baconesque Popcorn actually qualify as bacon though? Kind of… but not really. Normally I’d criticize a product for something like that, but in this case that’s what they’re actually advertising right on the bag. They promise fake bacon flavor and they deliver fake bacon flavor – should they penalized for that, or just stared at agog? They make it abundantly clear that in lieu of real bacon or bacon flavoring you will be getting “natural smoke flavor”. A psuedo-flavor that is sort of like putting your nose right above a sizzingly BBQ. “Natural smoke flavor” is the same thing as “liquid smoke”, which really is actually made from smoke. It’s usually made by burning hickory or mesquite wood and capturing and concentrating the resulting smoke in a liquid medium. The resulting taste is a general sort of heavily-cooked meatiness. There isn’t anything screamingly bacon-y about it, certainly nothing resembling the heady, savory tastes of Trader Joe’s incredible Apple Smoked or Black Forest bacons. It tastes much more like these pieces of popcorn were mixed with a few heaping handfuls of Baco Bits – those hard, granuated bacon imitators people put on baked potatoes and what have you. This strong and perplexing taste is combined with the equally strident taste of white cheddar – every bit as mouth blastingly cheesy as you would expect as if this popcorn was bright orange. The combination of extremely fake bacon flavor with extremely strong cheese flavor makes for one intense popcorn snack. I personally found the roller coaster ride of flavors interesting enough to come back to bag more than once – although each time I limited myself to just a kernel or two. This would be extremely hard stuff to munch down like your standard movie theater popcorn. It’s much better treated like a tin of sardines or a plate of olives – as an over the top flavor to be sampled in small quantities. Would I Recommend It: Probably not. The fake bacon taste is somewhat off putting. Would I Buy It Again: I might, I like a snack that demands you muse on it rather than gobble it down. Final Synopsis: Like cheesy popcorn with a bunch of Baco bits mixed in. Spicy, sweet glazed bacon. And also its jerky. Its everything. Guys, you never know what you’re going to get in this world. Case in point, Trader Joe’s Sweet Sriracha Uncured Bacon Jerky. Just look at this stuff – it could so easily be the worst thing or the best thing I’ve ever eaten in my life, and there’s simply no way to tell. I mean, let’s just look at the name for a minute here. “Sweet Sriracha”. Already we’re in trouble. Sweet sriracha? Sweet? I’ve had some sriracha in my time, I’ve even reviewed Trader Joe’s own take on sriracha, but I’ve never had sweet sriracha. We’re two words in and I’m already completely out to sea. 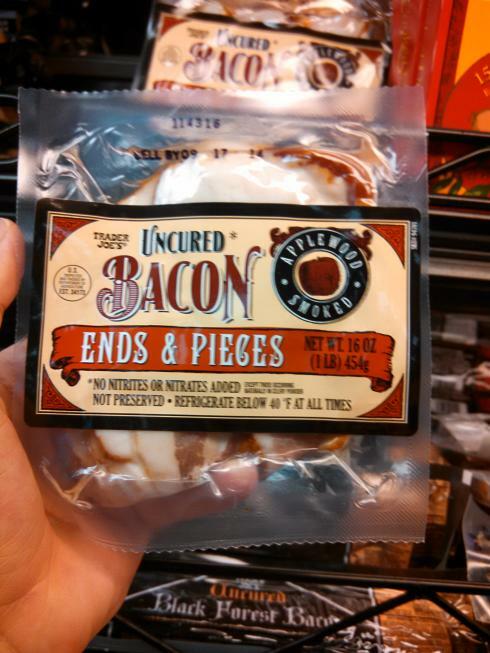 “Uncured Bacon Jerky”. Alright, that didn’t stick – let’s try it again. “Uncured Bacon Jerky”. Nope, nothing. I have no idea what that phrase means. Bacon jerky? Bacon? Jerky? Do they mean dehydrated pork slices? If so why don’t they say “pig jerky” or “pork jerky”. Do they actually mean dehydrated bacon slices? Isn’t that just bacon? Isn’t bacon already the crispy, salty, dehydrated form of bacon? What is going on here? Am I loosing my mind? There are no two words in the title I can put together and have them make sense. Look, I could go on, but there’s really no amount of words that are going to untangle this very confounding string of words. I guess we’re just going to have to crack the bag open and have a taste. And you know what, folks? If you do that, you are going to be absolutely floored by one of the most delicious, most addictive, downright tongue delighting foods Trader Joe’s has to offer. This bacon jerky is a sweet and spicy blast of terrifically chewy, sticky, bacon that you can eat straight from the bag and be delighted by the whole while. 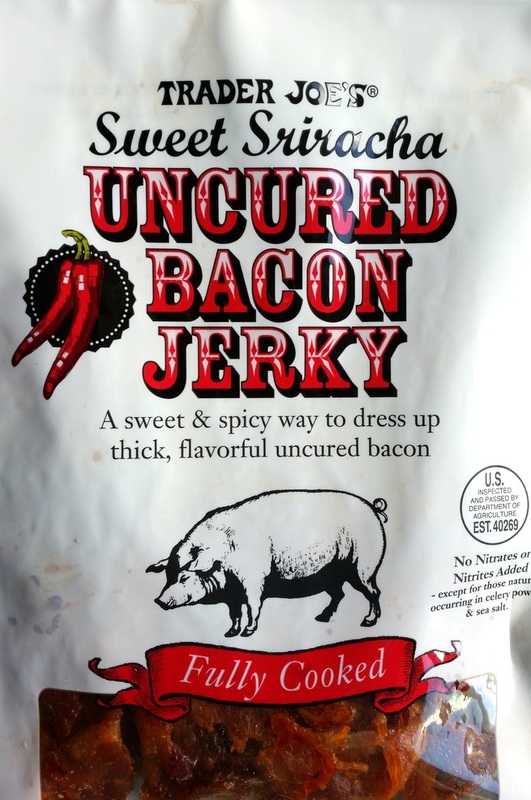 Bacon jerky, by the way, is apparently a thing. It’s when you take bacon and marinate it in a bit of savory spices. In this case, the spices are the incredibly addictive sweet sriracha sauce – basically Trader Joe’s standard sriracah sauce, but toned down to a much milder level of hotness. Into this plenty of white sugar and honey have been mixed to make a sweet glaze with just enough fire to get your lips smacking. The bacon itself is TJ’s standard “no nitrate added” uncured bacon, and its served up here in long, thin strips that stick together in one big gooey pile. To quote Lays, I bet you can’t eat just one. Bacon by itself is good enough, but add a sweet & spicy glaze to it, and you’re talking about an unbeatable experience. The only mark against it is the presentation which, in gooey bag form, is less than stellar. Even then, I couldn’t keep my fingers from teasing off strip after strip and gobbling it down. If you happen to prefer something more refined, Trader Joe’s suggests using it in place of regular bacon on your BLT, or crumbling it onto salads, or even over mac and cheese. Really there’s no way to go wrong with this stuff. These spicy, honeyed slices of portable, ready-to-eat bacon are winners from start to finish. Would I Recommend It: Not to orthodox Jews, but other than that yes across the board. Would I Buy It Again: I’m not sure I would trust myself with another bag. Final Synopsis: An evolution of the bacon experience that everyone should try! You’ve probably heard about the oncoming Breakfast Armageddon. Your traditional, western-style breakfast table of bacon and eggs – the hearty, workman-like breakfast of middle-class, middle America – is on an out of control roller coaster ride straight into the mouth of Hell. What I mean, of course, is that the cornerstones of breakfast – bacon and eggs – have seen unprecedented price spikes over the last 12 months (Source: Bureau of Labor Statistics). Due to a conflux of calamities, including global drought and widespread swine pestilence, the price for a pound of bacon has jumped nearly 19% between May 2013 and May 2014. Certainly I don’t want to be accused of fear mongering, but according to the computer simulators here at EatingAtJoes.net, if this trend continues a pound of bacon will cost $572.38 by 2029, at which point it will be cheaper to just start eating human. At the risk of appearing hyperbolic, I absolutely urge you to smash down the doors of your nearest supermarket and steal as much bacon as you can carry this very second. That, or switch over to Trader Joe’s Bacon Ends and Pieces! I picked up this oblong little pack of scrunched up pork while weighing my grocery bill against the climbing price tag of Trader Joe’s truly, truly delicious Applewood Smoked Bacon. I’m on the record as saying that the bacon fad long ago become tiresome, and am the foremost proponent calling for a period of bacon tumescence, say a decade or so, at which point we can all start eating it again and sticking it in vodka and whatever. That said, TJ’s applewood smoked bacon makes me go weak in the knees when I smell it sizzling up in it’s own, rich fat on the skillet. It was this battle of my animal id against my budgetary superego that Trader Joe’s so deftly diffused by producing their bacon ends and pieces. As you can gather from the name, Trader Joe’s Bacon Ends and Pieces are the assorted left over bits of bacon that they didn’t see fit to package in their regular packs of Applewood Smoked Bacon. To a certain mindset, that means you’re eating Trader Joe’s trash, but don’t think about that. Instead, focus on the deal! In exchange for choosing the bacon rejects, and forgoing the niceties of traditional packaging, you get 12 oz of delicious, nitrate-free, applewood smoked bacon for only two bucks and change, less than half the regular price. What I was expecting from that price, and the smaller package, was a bunch of irregular chunks of varying thickness. I was surprised to find that this wasn’t the case. On opening the pack, I discovered that the strips had been folded, but were otherwise the same size and shape as regular bacon. The big difference is in the fat/meat ration. While TJ’s regular Applewood Smoked Bacon is more or less uniformly fatty, these bacon ends varied between 50% – 80% fat. Obviously, this isn’t ideal. After all, I’m the yutz who usually buys turkey bacon. That said, a little carefully slicing with my kitchen knife before putting them in the pan left me with bacon that was as lean or leaner than what I normally get. It’s important to note, by the way, that your results may vary. The bacon ends and pieces are a grab bag by nature. The fattiness of the pieces, and their size, is likely to vary from package to package. I’m sure there are those of you out there who fear picking these up lest they be branded by the stigma of poverty. After all, isn’t this just poor people’s bacon? Well – yes, maybe. But don’t forget that what you’re buying here is not just a breakfast substitute, but a raw ingredient with a long culinary tradition. There are things you can do with bacon ends and pieces that you can’t do, or wouldn’t want to do, with the neatly packaged kind. 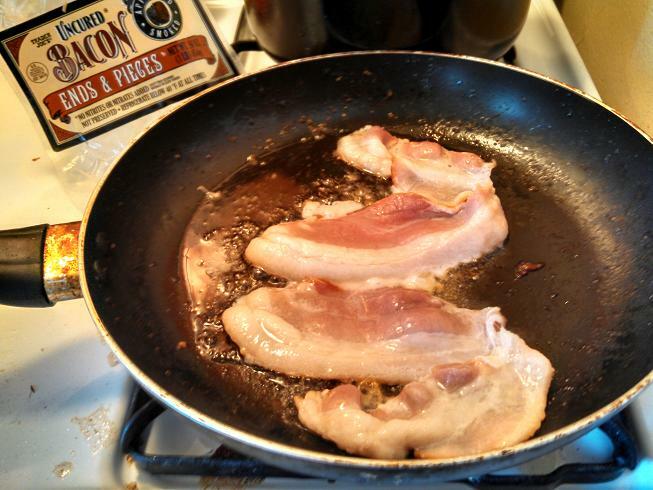 As the internet has exhaustively noted, the applications of bacon are limited only by your creativity, but in particular the higher fat content of the end pieces makes them perfect for dicing up and cooking in stews and soups, adding to green beans and baked beans, or any dish that you want to infuse with a rich, smokey hint of savory bacon. For my part, I poured off the excess bacon fat, then cooked my eggs straight on the still glistening skillet – giving them that extra touch of delectable goodness. If you’re happy with your bacon as is, by all means continue buying as usual. If, however, you’re looking for relief from the rising cost of breakfast, or are looking for some fatty goodness to throw in the stock pot, this bacon gets the job done. Would I Recommend Them: Yes, if you’re not concerned about your fat intake. Would I Buy Them Again: Yes for cooking projects, but they were too caloric for my everyday bacon. Final Synopsis: Extremely delicious bacon, with more fat for less money. Despite repeated phone calls, TJ’s is staying quite on how the bacon is cured, what’s in the dry rub, and whether the pigs are actually from the Black Forest. That raises more questions than it answers, Joe. Bacon week continues with Trader Joe’s Uncured Black Forest Bacon! This has been a banner week for me. The transition from a baconless existence to a world of delicious bacon has left me unnaturally giddy and elated. Not just one, but two different kinds of suberp, praise-worthy bacon have glorified my breakfast this week. Trader Joe’s Uncured Apple Smoked Bacon we already covered, and by gum if you don’t have some of this in your pantry already then I don’t know what you’re doing with your life. 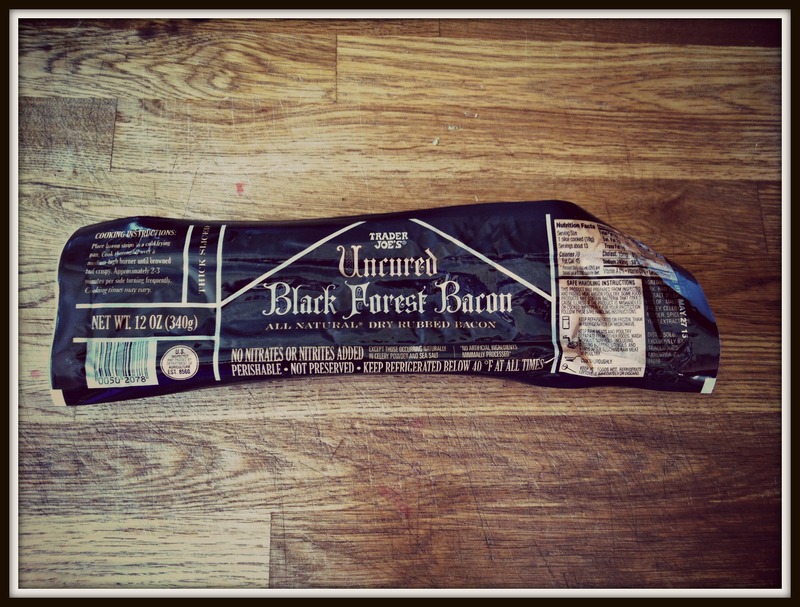 Today we take a look at Trader Joe’s other delicious bacon – Black Forest Bacon. Is the Black Forest bacon delicious? Absolutely – it’s a nice thick cut of fatty, smoky, slightly sweet bacon that is almost too good for this earth. Is it better than the Apple Smoked Bacon? That’s a trickier question. Where the applewood smoked bacon comes out the gate strong with plenty of razzle dazzle, Trader Joe’s Uncured Black Forest Bacon offers a more sophisticated and nuanced bacon choice. Tastewise, these bacons are playing quite different games. The apple smoked bacon has set out to dominate the world of smokey, strongly seasoned bacon and it has done exactly that. In a side by side taste test, I’d have to choose the the apple smoked bacon, no question. But real life isn’t a taste test. When it comes to a bacon you’re going to turn to every morning, you don’t necessarily want the intense flavor and smokey aroma of the apple smoked bacon day after day. In the same way that you don’t always turn to the maltiest beer, or the sweetest soda, Trader Joe’s Black Forest Bacon provides a more nuanced alternative. The taste of the black forest bacon is still as absolutely delicious as the apple smoked bacon, but plays up the “cured” side of bacon over the smoked side. You’ll notice the rind of spices on each slice forms a sort of natural crust once cooked, almost like a honey baked ham, and the raw sugar in the rub gives this bacon just a hint of sweetness. The taste is overall much broader than the apple smoked bacon, a little sugary, a little smokey, and lots of rich meaty flavor. Two other factors enter into the comparison: nutrition and price. 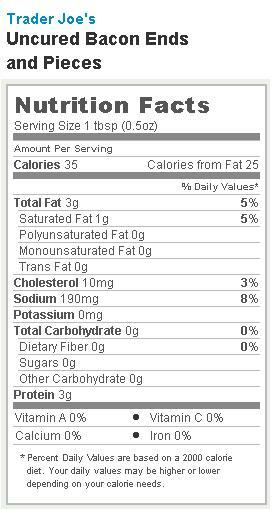 The Black Forest Bacon is actually the healthier choice, despite the sugar rub, with 70 calories a slice, and 45 from fat. 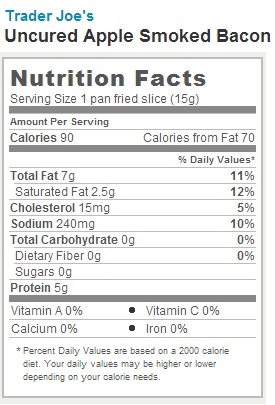 That’s still 5 grams of fat per thick slice, but that’s better than the 7 grams of fat in each apple smoked slice. 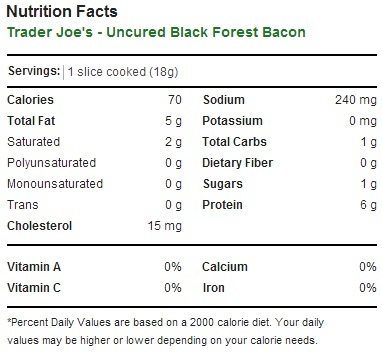 Pricewise, Trader Joe’s Black Forest Bacon is the more expensive option, $4.99 / 13 slice pack – a dollar more than the apple smoked variety. Like the apple smoked bacon, the black forest bacon is also “uncured”, meaning no sodium nitrate or commercial curing salts were used in the process – nothing but the natural nitrates found in sea salt and celery power. The takeaway is, on the balance these bacons are equally good. If you’re only an occasional bacon eater, the apple smoked version is probably the better choice – given it’s bigger flavor and worse nutritional profile. If, on the other hand, you’re snacking on bacon all the time, you might want to go with the more nuanced, and slightly healthier, black forest bacon. Would I Recommend It: Yes, but try Trader Joe’s Apple Smoked Bacon first. Would I Buy It Again: I already have. Final Synopsis: A delicious bacon for frequent bacon eaters.